Marshall Homes are pleased to announce the opening of the show house at Cliffewood Rise, Clayton West, Huddersfield on the 20th January 2018. With two homes on this development already sold, only three 4 bedroom detached homes remain. The remaining homes start in price from £350,000. 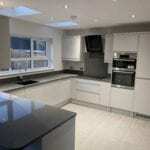 Any buyer has the choice of Kitchen, Tiles and Bathroom suite. The development will be open from 11.00am until 2pm. Please feel free to call in, no appointment needed. If you need any other details about the development, please don’t hesitate to contact our estate agents, Bramleys, 01484 530361.